VIGAN specializes in the design and manufacturing of port equipment for dry bulk handling, mostly agri-bulk. The company offers a range of bulk handling equipment, and has significant expertise in shiploaders and ship-unloaders. VIGAN loaders are designed for almost any kind of products in bulk (with densities ranging from 0.2 to 1.8t/m3), and are suitable for all sizes of barges or vessels. VIGAN manufactures continuous shiploaders, used for the uninterrupted loading of product, rather than discontinuous shiploaders fed by trucks. usually mounted on a slewing ring and can reach up to 40 metres to ensure optimal hatch coverage. The combination of telescopic and rotating movements allows continuous and uniform loading operations of the ship holds. The whole loading structure can be mounted on a self-propelled gantry on rails usually with cable reels; on a self-propelled gantry on rubber wheels, with diesel generator or cable reels; or on a fixed structure. VIGAN loading machines work with an electrically-driven motor or with a diesel power unit, and guarantee a capacity of up to 1,500tph (metric tonnes per hour). Several optional devices are available to adapt the loader to specific working conditions. Options include a slewable loading powered thrower that makes it possible to direct the bulk cargo flow sideways in any direction; or a jet slinger which can be mounted at the bottom of the telescopic loading pipe, also allowing for a fairly uniform spreading of the cargoes in the holds. VIGAN mechanical loaders are suitable for many applications. As each case is different, and each customer has specific requirements, VIGAN prepares special designs according to each specific bulk handling operation. VIGAN shiploaders are fully customized and specially manufactured. In most ports, controlling dust emissions is not only a major concern but also a main objective. the dust-free loading head and/or a dust suction equipment which can be installed at the telescopic loading spout. For instance, the bottom of the telescopic spout can be equipped with a large dust skirt at outlet. A level sensor controls the automatic luffing of the skirt at the bottom of the loading pipe during the loading process. The dust skirt remains always in contact with the pile of grain in order to control the dust emissions. The luffing occurs by automatic step of 20cm. VIGAN is currently installing a 1,500tph shiploader in Russia, for the loading of granulated fertilizer with bulk density of 0.96t/m3 into vessels up to 80,000dwt (Panamax). The gantry is mounted on self-propelled rails. One 34m belt conveyor fixed on the gantry transfers the cargo from the quay side belt conveyor to the top of the loading cabin. The conveyor is covered over full length with removable covers for protection from wind and precipitation. The loading boom has an integrated belt conveyor of 27.5m. a fan sucking the dusty air through the filter sleeves. The end of the loading boom is equipped with a telescopic loading spout with a large dust skirt at the outlet. During recent years,VIGAN has sold shiploaders in Kazakhstan, Poland, France, Latvia, Russia and Belgium, with capacities varying from 350tph to 1,500tph. Several other shiploading projects are also under way. TMSA Tecnologia em Movimentac¸a~o S/A, is one of the largest suppliers in South American market for bulk solids material handling, especially in port terminals, heavy duty and long distance conveyors. The company offers great expertise in the shiploading of bulk commodities. It is estimated that about a third of Brazilian exports of grains, meals and sugar pass through TMSA equipment. 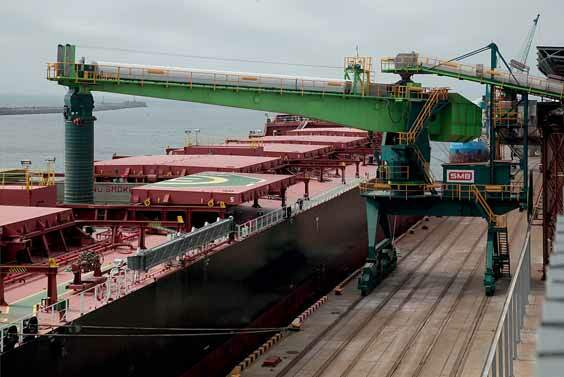 TMSA has supplied conveyors with capacities up to 20,000tph (tonnes per hour) and shiploaders for sugar, iron ore, coal, alumina and other heavy-duty commodities up to 4,000tph. Based in Brazil, the head office is in Porto Alegre, Rio Grande do Sul State, where TMSA has a major 35,000m2 manufacturing facility, housed within a land area of 80,000m2. This manufacturing facility has highly integrated engineering capabilities, with in house mechanical, structural, electrical, automation and de- dusting specialists; all under ISO 9001 certification. The working team is of about 700 people, including branch offices in Belo Horizonte at TMSA Minas and in Buenos Aires, at Bulktech Argentina SA. Roughly, about 100 employees work in the engineering department. one travelling, luffing and slewing boom type shiploader for 2,500tph of grains, based on soybean for Tegram/Itaqui Port in Sa~o Luiz, Maranha~o State, Brazil. These two projects were entirely designed by the TMSA engineering team, under a turnkey contract. The Tegram project includes railcar and truck reception and all belt conveyors that convey product from the warehouse to the shiploaders that are capable of loading ocean-going vessels of up to Capesize 125,000dwt. The APPA port is replacing four of its 1,500tph shiploaders which have been in service for decades at the port facility, with new TMSA equipment. The new equipment offers an increased belt conveyor speed of up to 2,000tph, and an extended boom to load big ships, up to Capesize 125,000dwt. The loading spouts for the APPA and Tegram projects were entirely designed by the TMSA engineering team; they allow the operator to load the hatch with dust aspiration, in order to guarantee low dust emissions for the environment. The same loading spout is capable of trimming the bulk material by using an in-built, pneumatically-driven spoon, to finalize every hatch loading operation. TMSA is investing heavily in qualified labour and integrated management software (Microsoft Dynamics ERP). The ability to provide innovative solutions is what the company sees as its biggest differential — not to mention a necessity for its survival on the global stage. Aware of this need to remain in the technological vanguard, the company continuously seeks outs partnerships with world-renowned companies. In today’s global market, one of the most important characteristics is sustainability. Consequently, the company invests a lot in solutions that attempt to resolve three major problems: noise, particle emission and energy consumption. In recent years,TMSA has developed a very special technological portfolio for the bulk solids material handling and conveying, which includes overland conveyors and the RopeCon system, from Doppelmayr in Austria, which makes it possible to choose the best solution for each bulk-handling project, by becoming a solution partner with local integration for key worldwide technological leaders. TMSA has the knowledge and experience for the proper selection of a conveying system, which has to be done by a proper analysis on a case-by-case basis, involving much more than only prices concerned on mechanical/structural technical aspects of the project. They must also consider operational costs, environmental and social issues, civil works and land access. Trade means exchange. This exchange still involves the transport of goods from one place to another, despite the effects of digitalization. Transport by river going vessels is one of the major traffic modes in many countries. In the South Asian state of Bangladesh, for example, more than 700 rivers and tributaries form one of the largest inland waterway networks in the world. This densely populated country depends on its waterways; they connect the major cities and thus the most important trade locations with each other. Rivers have therefore grown into a cost-efficient and effective alternative to an otherwise insufficient infrastructure. A precondition for the use of natural facilities is the availability of flexible loading systems that can also be used to support harbours at remote inland locations. They must be able to load barges that are suitable for widely branched rivers and make optimal use of the available storage space. This is essential for bringing goods to their destinations in an economically efficient way and without transshipping. efficient transport becomes. SMB therefore uses a two-step production method: loading systems are first designed directly at the Quickborn site near Hamburg. Here, all mechanical and electronic modules are individually developed and produced according to the requirements. They form the basis for custom- made implementation of projects and their subsequent installation on site. SMB can also draw on many years of experience regarding restructuring or capacity extension of old facilities. plate for even alignment, a telescopic loading head or even a telescoping spiral chute. The third version includes a spiral chute and cascaded chutes mounted on the same cantilever beam for combined loading of bags and bulk goods. The loading type can be optionally chosen according to the characteristics of the bulk goods. “We base each of our systems on the specific requirements of the customer to create an individual solution,” explains Andreas Heckel, Managing Director of SMB International GmbH. “Many systems handle up to 1,500tph — but much higher throughput is possible.” Quickborn shiploading systems have proven their performance strength over many years of service. Long-term economic efficiency is another, obvious goal for the designers. Lower insurance and transport costs, in addition to the shorter docking times, allow customers to make optimal use of waterways. “Systems must adapt to the circumstances, not the other way around, particularly when the infrastructure conditions are not optimal,” explains Heckel. This company philosophy distinguishes the German company from its competitors. Its success has encouraged SMB to continue along this route. “We have deliberately chosen a high vertical manufacturing range at our own site. This allows us to ensure excellent quality and guarantee reliability. Naturally, we want to do this to comply with customer requirements. However, our internal demands also act as a continuous incentive,” Heckel sums up the situation. The two companies SMB and MBA focus upon the material handling segment. The planning, development, manufacture, global distribution and servicing of highly complex, automated loading systems, filling systems, measurement technology for fill levels and conductivity, palletizers and shiploaders form the comprehensive product portfolio. The SMB Group has consciously opted for a high degree of in-house manufacturing at its site in Quickborn. This enables customers’ requests to be implemented in a spontaneous, targeted and rapid manner, whilst retaining the same high quality. A high-end mechanical and electrical manufacturing facility coupled with the focus on pre- assembly allows the assurance of qualitative and delivery reliability. Highly qualified installation and service teams work on domestic and global projects. The distribution network, which has operations worldwide, ensures swift and effective information-sharing and co-ordination. Shiploading and unloading yards have many unique challenges with the wind blowing constantly and kicking up dust. WeatherSolve Structures is able to provide 100% custom- designed dust control solutions with its clients’ requirements in mind. size: the smallest control systems are simply wind fence extensions to the sides of a hopper, or a cage around a transfer point. The next size up is a few tens of meters long and block off key wind (and dust) acceleration zones. The largest are kilometers long and completely surround troublesome stockpiles. Thepolesareabletobe 30m (100ft) apart and over 30m high. reliability: functional in extreme weather conditions with minimal maintenance. Over 35 years of experience and engineering development have gone in to the design and components. They stand up and WeatherSolve Structures stands behind the capabilities of the system. The structures have proven successful in a wide range of extreme environments — from marine, to northern cold to Middle Eastern deserts. flexibility: able to accommodate a wide range of equipment access requirements. All of the company’s fences are custom- designed to suite the individual needs of the customer. Because the poles can be widely spaced,WeatherSolve Structures is able to accommodate conveyors or any other equipment, doorways for people or vehicles, gates and it also offers retractable systems for areas requiring access. convenience: can be constructed with minimal operational disruption. This is achieved because WeatherSolve Structures’ systems have few poles or other obstructions. They can also easily be built over conveyors and small buildings without affecting those structures. portability: for sites such as temporary storage or shifting of small stockpiles with portable conveyors,WeatherSolve Structures has a range of portable (towable) wind fences typically from 12–30ft high. adaptability: can be adapted to suit available construction materials and equipment. The fences are custom-designed to match customers’ requirements, both structurally and aerodynamically. working well with others: WeatherSolve Structures is able to optimize agglomeration systems such as fog. It does this by lowering the wind speeds allowing time for the agglomeration agent to bind with the dust (and not get blown away) and settle back down. hoppers: material that is being dropped or tipped from a height creates a rush of dusty wind because of displaced air. This air can then be caught up by regular winds around the site which spread the dust even further. A WeatherSolve Structures wind fence around the discharge area (i.e. the hopper) can help by protecting the discharge area from the natural wind as well as containing the dust plume that is created by the displaced air and allowing time for the dust to settle again. shiploading/unloading conveyors: these are typically in windy situations. WeatherSolve Structures is able to provide breathable cladding on the side of the walkway around the conveyor. In addition to dust control,this hastheadded benefit of improving the safety of people using the walkway. WeatherSolve Structures designs are optimized by considering turbulent wind flows and dust particle tracking results obtained from detailed large-scale virtual models. The models are solved using computational fluid dynamics run on high- performance computers that can take as long as 24 hours to run a single set of computations! The modelling work is performed by Midwest Research Institute Global, a not-for-profit, independent research organization internationally recognized as an expert in the field of fugitive dust emissions. Outputs from some of their work are shown below. The inputs to the models include data from laboratory and full scale studies analysing WeatherSolve systems. In Colombia, the Sociedad Portuaria Regional de Barranquilla (SPRB), which operates the Port of Barranquilla, has acquired a new barge- loader from Telestack. Carl Donnelly, the sales manager overseeing the contract, notes that, at the port, imported grain is brought in by Handymax vessels, with consignments initially unloaded directly into hoppers and then stored in warehouses on the quayside. For onward transport, the grain is again loaded onto trucks, which is loaded on ‘Impala’ barges for transport up the Magdalena river to end users further inland. “The mobile barge-loader that Telestack has sold to the SPRB forms an integral part of this logistics chain, since it is used to move the grain efficiently from ‘truck to barge’, thereby minimizing double handling, contamination and dust emissions often inherent when differing types of grains are being handled,” says Donnelly. The original order for Telestack’s TU 515R barge-loader was placed in 2014. Following the full design, manufacture, assembly and testing of the equipment at Telestack’s state-of-the-art facility in the UK before it dispatched, it was installed and became operational in early 2015. Quizzed as to why the SPRB had chosen Telestack to supply the equipment, Donnelly explains that Telestack has extensive experience in this area, with many proven designs already delivered to blue chip companies globally, including to many reference sites in South America to date. “Telestack is already a world leader in the supply of mobile bulk material handling equipment for use in ports. In addition — and unlike many rivals — we are able to customize every aspect of the equipment to meet the specific needs of the application. However, as with every contract, in order to get things just right, we have had long discussions with our customer’s engineering and technical teams over a period of time to ensure all aspects of the project was fit for purpose,” he says. No Telestack competitor, Donnelly adds, could meet the flexibility and mobility inherent in the truck-to-barge design provided by the company to SPRB. Unlike in many other contracts,Telestack equipment in Colombia is not replacing an incumbent handling system; the deployment of the TU 515R to Barranquilla was done specifically to enable the port to commence an entirely new barge-loading operation. However, the port company did not look at barge- loaders in isolation; it also considered a possible mobile harbour crane (MHC) operation. According to Donnelly, there were several reasons why, ultimately, a Telestack solution was preferred. First and foremost, there was a lower capital investment required, which is always a key point in any sale. But it was not simply the financial aspect that persuaded the SPRB to buy the Telestack machine, as Donnelly explains: “The use of an MHC increases double handling of material, since trucks conveying consignments would have to offload them on the quayside, leading to both potential contamination of the material and increased dust emissions. In contrast, the TU 515R barge-loader ensures direct loading from truck to barge, thereby eliminating double-handling bottlenecks, and improving operational efficiencies.” He also emphasizes that Telestack could also offer a faster lead time from order date to installation. Also no dedicated, trained operator is required to use the Telestack barge-loader, either, since it is a very simple and easy to use piece of equipment. Contrast this to a mobile harbour crane, which needs a highly experienced operator, thereby generating additional labour costs. “And, at the end of the day, all of these factors mean an overall reduction in the cost-per-tonne handled,” stresses Donnelly. In terms of how the unit deployed in Colombia has been designed, it was based on a proven standard developed by Telestack, then customized to meet the specific needs of the application. The tipping point, for example, has been custom designed for the customer’s trucks to ensure that no spillage occurs during loading and that there is continuous feeding, resulting in a regular truck cycle time. The SPRB unit also incorporates a dual power electric supply, which means operating costs can be kept low. Under normal circumstances, the barge-loader is driven around the site and operated via the integrated CAT 96.4KW diesel hydraulic engine. However, to minimize fuel consumption, an integrated electric system allows the conveyor belts to be driven electrically from an on-shore power supply. Telestack’s engineers have also made sure the unit has been optimized to handle grain in the most efficient manner possible. So, chevron belts have been fitted to ensure the free-flowing of material. In respect of environmental protection, the unit offers integrated dust enclosure around the tipping area, as well as dust covers on the incline conveyor and a fully enclosed discharge chute to direct the material into the barge. “Understandably, the harsh marine environment of Barranquilla Port was of concern to the customer. However, we have applied a 250 Micron (marine grade) paint finish with integrated zinc primer to the finish of the barge-loader, thereby ensuring maximum protection,” says Donnelly. He points out that Barranquilla is very much a multi-purpose port, handling both dry bulk and containers, so the mobility of the barge-loader was critical, since the operator has to be able to move the unit off-site when needed and easily transport it from site to site as ro/ro (roll-on/roll-off) cargo load, if required. Rather than fit conventional wheels to the barge-loader, the customer opted for tracks, which incorporate rubber pads. This has been done to ensure that no damage is inflicted on the asphalt or concrete surface of the quayside on which it operates, but allows easy movement of the equipment. The use of the all-function radio remote control also allows the operator maximum flexibility when moving and operating the unit, especially when trimming out the barge. For example, the unit can be positioned at many different angles, depending on the size of the barge and discharge point of the trucks/wheel loaders. Based on the use of 25-tonne trucks, this specific barge-loader has a loading capacity of 300–400tph (tonnes per hour) when handling grains at 0.7 tonnes per cubic metre. Finally, in respect of Telestack’s after sales support, Donnelly, points out that the TU 515R barge-loader is being supported and maintained by a local representative on this project, Gestio´n y Gerencia de Proyectos Consultorias (GGPC), which is based in Barranquilla. “This company is vastly experienced in this industry, currently supporting other, similar brands, such as Terex Gottwald and Kirow, in Colombia. Going forward, the equipment will be continually supported locally in terms of maintenance, operation and spares provision to ensure the effective long-term success of the project,” says Donnelly. Telestack’s range of equipment is working in a variety of applications including coal, iron ore, aggregates, fertilizers and grain. They have reference sites across the globe in mines, ports, quarries, power plants, steel mills and cement plants and a team of specialists to support all projects. Telestack have a global proven record in a range of applications including the coal, mining and quarry industries, stockyard management, ports and inland terminals, power stations, rail yards, steel mills, cement kilns and many other bulk material handling industries. The company’s mobile solutions offer significant operating cost savings compared with traditional methods of material handling (wheel loaders, haul trucks, static conveyors), as well as providing environmental, health and safety and other benefits. Other significant benefits include not requiring planning permission due to product mobility and flexibility to move Telestack products to work on other projects.